IN THE BEGINNING there was three: Pete Johnson, Albert Ammons and Meade Lux Lewis. These men, fine pianists all, created the great boogie woogie rage of the 30s and 40s. They stood at the peak of the boogie woogie pyramid. Everybody imitated them; all the big name bands had to have boogie woogie arrangements. But the real article was played on by a few pianists, of whom these three were the best. Pete Johnson is generally considered to have been the most brilliant of the three. IN THE BEGINNING there were three: Pete Johnson. Albert Ammons and Meade Lux Lewis. These men, fine pianists all. 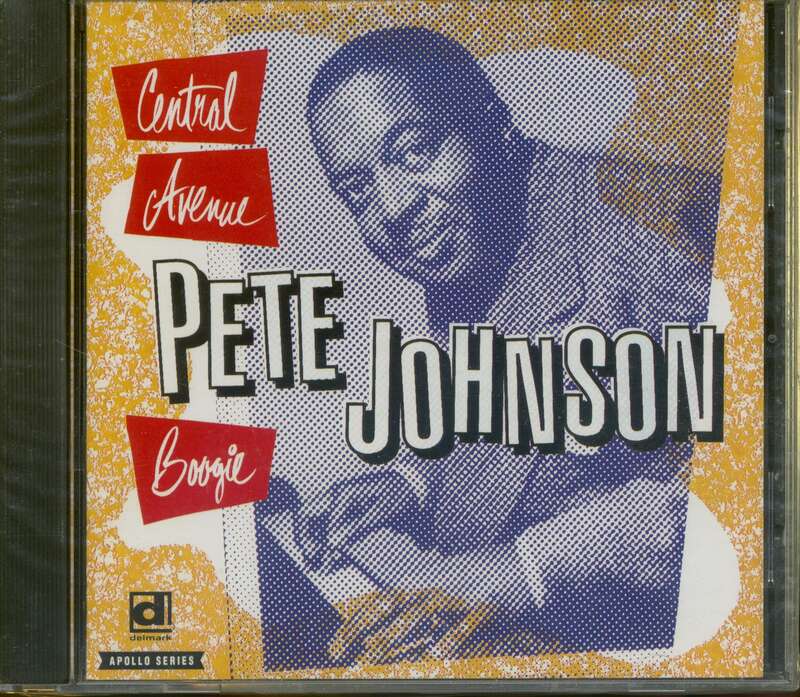 created the great boogie woogie rage of the 30s and 40s. They stood at the peak of the BW pyramid. Everybody imitated them; all the big name bands had to have boogie woogie arrangements. But the real article was played only by a few pianists. of whom these three were the best. Pete Johnson is generally considered to have been the most brilliant of the three. His notes were sharp and incisive and his chords were sounded separately. Physically, Pete was a powerful man. with immensely strong shoulders and arms. He had to be strong to play his fast. 8 to the bar blues for as much as 10 or even 12 hours a night. and be heard above the noise of a crowded night club. Pete became a big name in Kansas City before he went to New York. and became nationally and even internationally famous. up Jimmy Rushing on one and Joe Turner on the other, were judged by Down Beat to be the best records of 1956. Every track is the very essence of the blues, and are further proof of Pete's mastery of the blues. Pete was born in the right place. at the right time, in Kansas City in 1904. When he came of age Kansas City was a big. wide open city. jumping day and night. It attracted musicians like a magnet. They came by car and train and bus. and some even rode the rods. Count Basie of Red Bank, New Jersey. formed his great band in KC. One night in a club where Pete was playing, the bartender hung his towel over his shoulder, walked over to the piano and began to sing. The famous partnership of Pete Johnson and Big Joe Turner was born. and Joe did no more bartending. They went to New York together. The best way to destroy an art form is to com-mercialize it. and that's what happened to boogie woogie. a folk art. By the mid-fifties BW had lost much of its popularity. The glory days were over for Pete. He settled in Buffalo. formed a small combo of good musicians and played in local night spots. In 1958 he had one last fling at the big time. He made a very successful tour of Europe. where he was immensely popular, and he starred as featured artist at the Newport Jazz Festival. The band he led there had such musicians in it as Jack Teagarden, Buck Clayton. Jo Jones, Georgie Auld and other top flight men. After coming home from Newport in July of 1958. Pete had a stroke and was no longer able to play the piano. The rest of his life. nine years. were to be a struggle against sickness. Pete was fortu-nate in one respect: his loyal and loving wife. Marge, devoted her life to caring for Pete, and she did this right to the end. No man could have had a better wife than Marge. 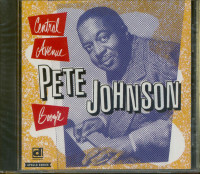 In about 1961 there was a big benefit program for Pete at the Symphony Hall in Buffalo. 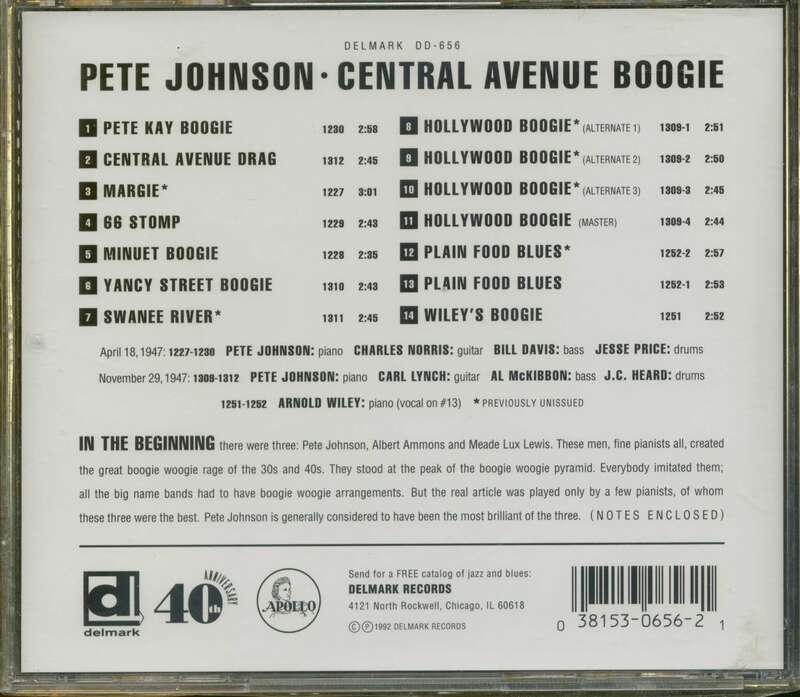 Customer evaluation for "Central Avenue Boogie"